Mad Men The Collaborators recap: Pete's love nest needs toilet paper. 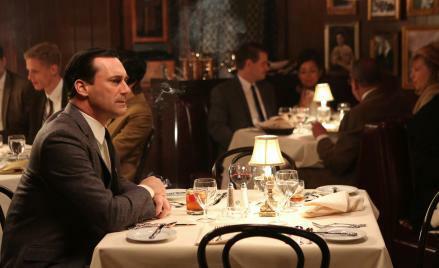 Mad Men The Collaborators recap: Pete’s love nest needs toilet paper. Don is a rooster. Pete is a john. Johns and whores. She saw the world that way. Pete is of course a john. What did you think of his amazing pad? Poor Trudy; she tried to create a system that could work for Pete, to give him what he wanted while keeping up appearances, but the man couldn’t even operate at that base level. Which is why his apartment is so hilarious; he’s surrounded by sophistication at work, and given the opportunity to be a player he came up with that insane coat rack. The man is a monster. Trudy tried to make it easy for him and he was too dumb to see it. “There’s nothing like things going badly when you leave, is there.” “Your friend’s mistake was underestimating you.” The things Peggy, mocked by her staff, yearns to hear. Yet once they get ketchup, the Coca-Cola of condiments, will Cutler, Gleason, and Chaough be content to leave vinegar and baked beans with Sterling, Cooper, Draper, and Pryce? What agency will get the gherkins? Joan is haunted by Herb, Jaguar salesman and boor who traded business for a night with her; his character is all shtick and vileness. She snaps at him, mocks his weight. His continued presence is the penalty for one night on her back. In Season 1 she was the grand operator, the wise counsel, but she hasn’t figured out how to navigate this level. She tries to cut him and fails; it’s Don who completely obliterates him in that later meeting. And why? Because to hell with Herb, that’s why. And why that? Well, think about how Don sees clients. Think about how he sees power. His mother died; his father died; and he’s left with his stepmother Abigail, pregnant with the boy who would be Adam, the brother he will betray. And here they are in a bordello with “Uncle Mac,” whom Don, in seasons prior, remembered fondly. Mac is unambiguously in charge; a rooster running the henhouse (not always the most subtle writing, is it?). We finally see the man who will guide Don into adulthood. “Find your own sins,” says one of the prostitutes. “Stay away from Mac.” He does the opposite; he peeps through the keyhole to see Mac atop Abigail (who hated Don for being a whore’s son). A huge lesson in hypocrisy and power. Whores and johns, agencies and clients. Pete asks Don why he won’t just give Herb what he wants. Because of the way Herb sees the agency. Because of the way Herb sees Joan, sees the world. Because Herb is a john. How strange and cold that there was no mention of Lane during the Jaguar meeting. As the televisions left on in the background remind us, 1968 was a bad time for American exceptionalism. The embassy in Saigon had been attacked; the USS Pueblo and its crew were captured by North Korea (you can still visit the boat in Pyongyang). Our authority as a nation was at risk. In hindsight we know it wasn’t going to get better—we’d be in Vietnam for years; North Korea is even today a thorn in our side. All the machines are breaking down. But of course these people couldn’t know that. The systems—even the mature systems, the processes and understandings that would get Pete laid at his bachelor pad, or bring Peggy the glory she wants, or get Megan with child—they’re all breaking apart. It’s all unexpected. Don functions best when the rules are whorehouse rules. In this episode he functioned quite well. Sylvia Rosen is a Catholic, though, and her system is inviolate. Bigger than Don’s system. If she becomes pregnant she’ll hold on. And Megan wants a child as well. There are a lot of uteruses showing up in this first act. Don should get a vasectomy.